The holidays can be a difficult time for individuals suffering from depression, anxiety, and loneliness. Often these feelings can be triggered by unrealistic expectations of what the holiday season is supposed to be. For the approximately 6 percent of Americans afflicted by Seasonal Affective Disorder, this can be compounded by the increased darkness that comes this time of year. 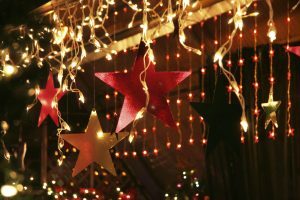 It can be hard to avoid the relentless drumbeat of holiday joy served up by retailers and the media, with visions of cheery Christmas villages, snowflakes, lots of gifts, and happy children. Be aware that that is marketing and not necessarily reality. The holidays are not perfect and never have been. Family members cannot always be present or happy. Be willing to go with the flow and enjoy the good things, whatever they are. The holiday season can be a very busy and trying time. Do a little planning to make sure you fit in the things that are important to you and avoid last minute conflicts and stress. Don’t be afraid to say “no” to people, projects, and events. Nothing makes a person feel better and more valuable than volunteering to help others. It doesn’t have to be something big or time-consuming, it just has to be something to make things a little better or easier for someone else. The holidays are a time of forgiveness, so let go of the things that cause problems with friends, family, and co-workers. You’d be surprised at how much easier life can become and how much better you’ll feel. The holidays can be very stressful financially. You can reduce that stress be creating a budget for gift-giving and holiday entertainment and then sticking to it. It’s important to remember that expensive gifts don’t buy happiness or love. It’s tempting to overindulge during the holidays, but unhealthy eating and drinking can lead to both physical and mental issues. Get plenty of sleep and practice things that promote relaxation, such as yoga and meditation. The holiday hustle and bustle can wear you down, so take periodic breaks to rejuvenate. Make some time for yourself. Go for walks to enjoy holiday decorations. Listen to relaxing music. Just stop, breathe deeply, and do something you enjoy to clear your mind. While there are many things you can do yourself to reduce holiday stress and anxiety, you don’t have to go it alone. If you find yourself feeling persistently depressed, sleepless, or irritable, these may be signs of bigger issues. Depression is treatable, so talk to a doctor or mental health professional. Help is always available. At Metropolitan Home Health Services, we specialize in providing a wide range of home health services to support patients and the at-home and professional care providers who care for them. This entry was posted in Tips and tagged depression, feeling sad around the holidays, holidays, surviving the holidays. Bookmark the permalink. Comments are closed, but you can leave a trackback: Trackback URL.